Yes, we enter the Ham Lottery every day. (For $10 a piece, two lucky winners a day are ushered into front row seats in an endorphin-soaked daze. We actually know someone who won!) No, our kid can’t miss school to sleep out overnight in front of the theater for days on end with the encampment of others on the show’s ticket cancellation line. What she can do, we agreed, is earn her way in. Lemonade stands and busking in Central Park didn’t do it. But was there another way for our daughter and two Hamiltoniac friends to go? Kickstarter! And while they were at it, the three fifth graders found a worthy cause to donate any extra proceeds—a theater project for kids, 52nd Street Project. The girls have come up with worthwhile “rewards” for their backers including an On-the-Road-to-Hamilton Diary bursting with tales and images of the wild up’s and down’s of their journey, and for big donors a pen-and-ink old-fashioned “Hamilton-style” personal letter or an original rap song. Rent was Miranda’s creative tipping point. In life we get only so many creative tipping points…if we see them. If we seize them. 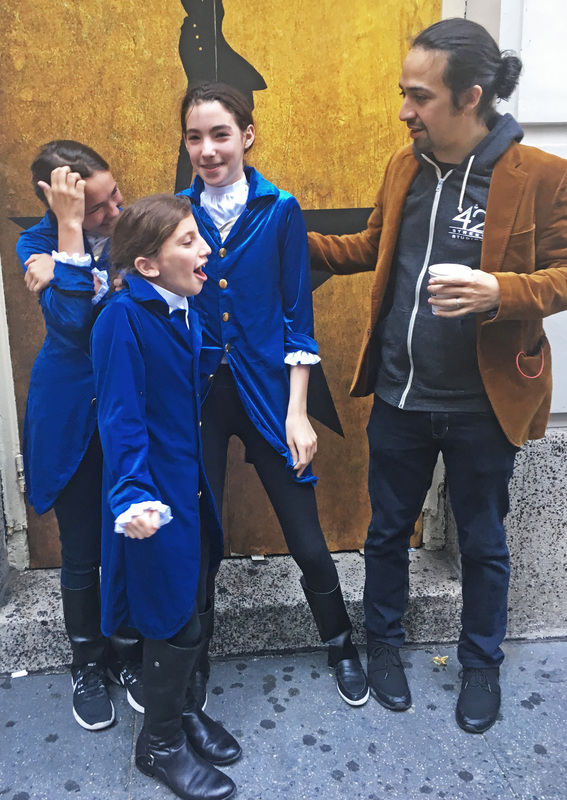 We’re hoping, even though they’re young, that for our daughter and her friends and the kids whose love of theater they’re supporting that seeing Hamilton is one in a long series of creative tipping points.